Broad Stand is the single most technical part of the round. One of the earliest recorded rock climbs; it is, by todays’ standards pathetically easy ( in fact its given climbing grade is “moderate”). However for a tired runner who may not be comfortable with exposed scrambling it can be a daunting proposition in either direction. Indeed I know of a very good rock climber who when doing the BGR had friends ready with a rope. The “difficult” bit is only 3m or so in height but a slip could result in a 20m fall so a rope is a reasonable requirement. If you do not fancy your chances at this then Foxes Tarn or Lords Rake are the only alternatives, but both involve a large descent before you begin to climb up again. Lords Rake is currently in a dangerous state: see Lords Rake (and click on “Black Spots”!) for pictures of both Broad Stand and Lords Rake. Ideally you should get a couple of climbers to rig Broad Stand for you. If none are available though it is self-help time. Recently (early 2009) several expansion bolts were installed on Broad Stand. This was regarded as totally unacceptable by both the climbing and fellrunning communities and the bolts were removed at the earliest opportunity. If you do not feel confident enough to attempt Broad Stand without resort to such damaging actions then please go via Foxes Tarn or Lord’s Rake. Nowadays the climber is usually attached to the rope via a harness. However commercial harnesses are both cumbersome and tend to weigh a kilo or more. Not the sort of thing that you want to be carrying. They also require a slightly involved and somewhat time consuming method of fastening if they are to be safe. The first method presented here takes just seconds to apply and requires one karabiner or snap-link and one sling. These will pack down to around the size of a sandwich and weigh little more. Take one 8ft sling and clip the karabiner into the loop. Holding the karabiner in your left hand pass the loop around your back so that one strand lies just above your hips with the other hanging down and grab the free end with your right hand. Now bring the two ends of the loop together and clip the karabiner into the loop held by your right hand. Now reach between your legs and pull the hanging strand through and up to meet the karabiner. Clip the karabiner into this third loop end. You should now have a karabiner that is clipped into three “end loops”: one that passes around your waist and one for each leg. This is your harness, a figure of eight knot on the bight is tied into the end of the rope and clipped into the karabiner. An alternative is to simply tie the rope around your waist using a Bowline knot. This is not as comfortable in the event of a fall but requires no equipment other than the rope itself. It is after all what climbers themselves used before the invention of sit-harnesses. It does require the ability to tie the knot correctly though. As with all such techniques it is worth practising until you have confidence in your own ability to tie these knots. If in doubt find a climber to help you. An alternative to all the above is to go via Foxes Tarn via the yellow line in the photograph below. 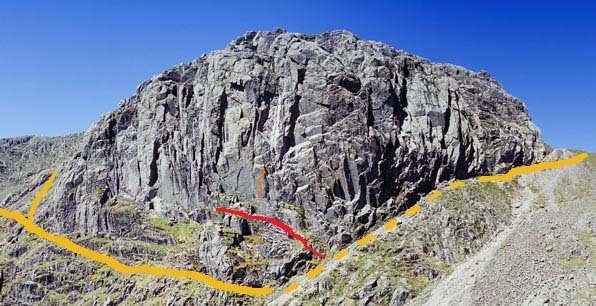 The red line looks like it is a way across but is just a climbers’ means of access to the crag and is a cul-de-sac for non-climbers.